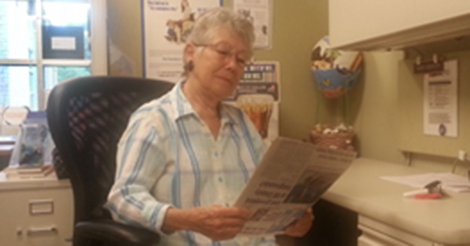 Barb has been a volunteer with Disability Network Southwest Michigan for over three years. She helps us with various duties in our St. Joseph office. Over the years she has helped with our filing system, mailing information to the community, making customer satisfaction calls, helping with reception and working on our newspaper article scrapbooks. Barb will be retiring as a volunteer to do traveling plans and volunteering with her church and the soup kitchen. Barb will be greatly missed by all of our staff in the St. Joseph office. She has helped to make a difference in the lives of the people we serve with her positive attitude and friendly smile. Thank you, Barb, for being a great volunteer and best of luck on your new adventure. Congratulations on being the May 2016 Volunteer of the Month!